Samuel Norman died on 22 Nov 1735 aged 76, and was buried at Keach's Meeting House. His wife Martha (d.1742) was the daughter of William Gyles the elder (d.1702). Their daughter Martha Burch predeceased her father. 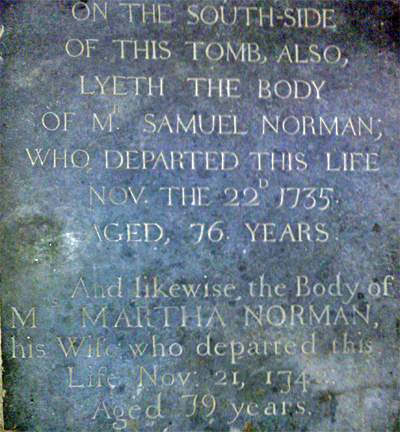 Samuel and Martha also had a son called Samuel (buried 22 July 1718). See Gyles Family page. Apart from other provisions for Mary amounting to about £3,000, and another £2,000 added in a codicil of 27 Feb 1754, the residue of the estate went to his son Samuel Norman, the sole executor. The will was proved at London at the PCC on 4 October 1758. The will of William Norman's son Samuel Norman of Henley-on-Thames, esquire (National Archives, PROB 11/1222/94) was made on 2 April 1792 and proved at London at the PCC on 11 Aug 1792. He was married (22 Feb 1753) to Frances, daughter of Stamp Brooksbank (1694-1756, MP and Governor of the Bank of England). He had a daughter Elizabeth married to Thomas Morton (or Norton) Pawlett (or Powlett) and a daughter Mary married to Rev. John Ord. Another daughter Frances, deceased, was married to Thomas Hall. He lived on the east side of Bell Street, Henley. His trustees were to be Benjamin Bond Hopkins of Wimbledon and William Smith of Clapham. His extensive property included Ram Hill Farm at Oving and unspecified messuages, lands and tenements in Winslow and Steeple Claydon in the occupation of John Goodman and William Hicks, left in trust for his daughters. After Enclosure he had about 29 acres of land in Winslow, which was inherited by his daughters Elizabeth Powlett and Mary Ord (special court, 1 June 1795), bought by James Burnham (special court, 12 June 1795) and then the Yeates family. He mentions his sister Mary Ryder. There are no other references to Norman or Gyles relatives. The will of William Norman's daughter Mary Ryder of Reading (National Archives, PROB 11/1445/67) was made on 21 Feb 1806 and proved on 12 June 1806. She asked to be buried in the burial ground of the Meeting House of the Congregation of Protestant Dissenters (Independents) in Broad Street, Reading, and she left £500 to be invested to support the minister there. She left the house where she lived in Friar Street, Reading, to he niece Elizabeth, wife of Thomas Norton Powlett of Topsham, Devon for life, then to her great-niece Mary Ann Ord, daughter of Rev. Dr John Ord of Fornham, Suffolk. She left £500 and her horses and carriage to her nephew (see above) Thomas Hall. She left £100 to her sister-in-law Mrs Frances Norman of Henley. There were bequests to 5 servants. There is no sign of any remaining connection with Winslow, and she probably sold all the property which came to her by her parents' marriage settlement in 1765, when her husband Lomax Ryder is known to have disposed of one house.